The sight of 1,000 new federales on the streets of Acapulco may or may not make tourists and residents feel any safer, but that’s what they’re going to get. As part of the “Secure Guerrero” (Guerrero Seguro) initiative, the Mexican Federal police have reinforced the city’s tourist strip with over 1,000 new officers, as well as 173 vehicles and two helicopters. This comes after recent reports of tourists being shaken down by police, as well as a confrontation between police and student demonstrators on the Acapulco to Mexico City highway (Autopista del Sol), near Chilpancingo, in which two students were shot dead. 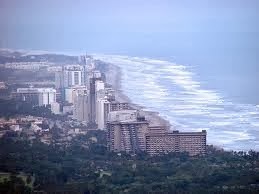 The Public Security Secretariat (SSP) reported that the focus would be on tourist areas and “hot spots” where crime has occurred in the past, with increased patrols in areas where there is a high concentration of people, including the coastal areas and the “Zona Diamante” (Diamond Zone). But will a stronger police presence make Acapulco's Zona Diamante more secure? Officials said they would also be adding security to the airport area, and that there would now be a permanent presence on access roads and highways leading to and from the city. The intention is to provide fixed support for tourists and residents, allowing for quicker communication and, hopefully, a reduction of crimes committed while people are in transit. Officials noted that as a state-wide initiative Guerrero Seguro had already resulted in the arrest of 245 people between October 8 and December 28, all of whom were linked to criminal groups operating in the port of Acapulco. Among the major arrests were two leaders and founders of the criminal gang known as "La Barredora" (The Sweeper). Officials are encouraged by the fact that the public has more confidence in making complaints to the police, though those numbers still appear low, given the size of the challenge. Since the beginning of Guerrero Seguro and the implementation of an anonymous citizens’ complaint system, there have been a total of 169 complaints. Of these, 38 were against organized crime, and 36 were for the sale of illegal drugs. All in all, 127,462 kilos of marijuana have been seized, as well as nearly half a kilogram of cocaine. Officials have also seized 25 rifles, 45 handguns, five grenades and 194 stolen vehicles.